Turn the Easter holidays into an unforgettable holiday in Lucky Bansko SPA & Relax aparthotel! Once again the team of the hotel will welcome its guests warmly and with personal attitude. Especially for our guests we organize a free transportation to St. Trinity church in Bansko for the Easter mass. 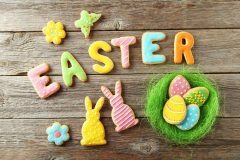 After midnight in the the hotel’s lobby will be served a festive toast with Easter eggs, homemade Easter bread and glass of wine. On Sunday, 08.04.2018, we are expecting you for a festive lunch with Easter salad, juicy and tender lamb. Let’s be together during the bright Easter holidays!